In this Adaptation Name Game, students sitting or standing in a circle play a version of tag, with one person in the center. When a person in the circle says another person’s name, the person in the center of the circle tries to touch the person whose name was said, before they can say someone else’s name. Later, students pause to brainstorm strategies to improve their performance, then play some more. Students learn that this was a representation of how certain structures and behaviors help organisms survive in their habitat, and that these are adaptations that species inherit over time. This game helps students learn each other’s names, while “lightly” introducing them to what adaptations are. 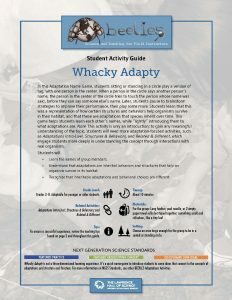 Note: This activity is only an introduction; to gain any meaningful understanding of the topic, students will need more adaptation-focused activities, such as Adaptations Intro-Live!, Structures & Behaviors, and Related & Different, which engage students more deeply in understanding the concept through interactions with real organisms. Learn the names of group members. organism survive in its habitat. Recognize that inheritable adaptations and behavioral choices are different.